NASCAR Race Mom: Will Brian France Suffer Indefinite Suspension? "I apologize to our fans, our industry and my family for the impact of my actions last night," France said in a statement later Monday. "Effective immediately, I will be taking an indefinite leave of absence from my position to focus on my personal affairs." NASCAR began random drug testing in the 2009 season. All NASCAR drivers, at-track crew members and officials must pass a drug test from an approved lab in the 90 days prior to applying for their NASCAR license. NASCAR can then ask any member to submit to a drug test at any time for reasonable suspicion and conducts random drug tests on event weekends. 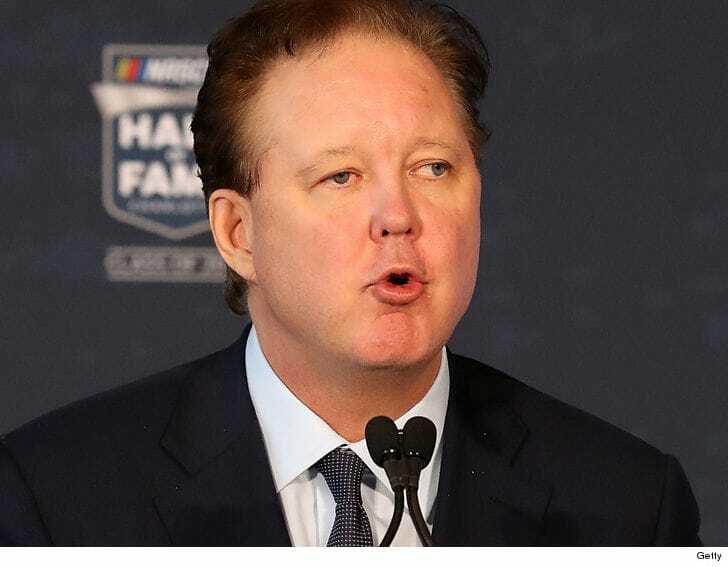 To be reinstated, if found in violation of NASCAR’s Substance Abuse Policy, the violator must participate in and satisfactorily complete a "Road to Recovery" plan. That plan may include substance abuse counseling, treatment or rehabilitation. The policy also states that any NASCAR member who voluntarily acknowledges a substance-abuse issue will not be suspended under the program -- except that in the interest of safety, NASCAR can temporarily suspend the license until the NASCAR member has been rehabilitated to the satisfaction of NASCAR. Sadly, the CEO and Chairman of NASCAR (since 2003) Brian France was arrested for ‘Driving Under the Influence’ last night in the Hamptons. France was contacted after failing to halt for a Stop Sign and his blood alcohol content was more than twice the legal limit. Needless to say, he failed the field sobriety test and was placed under arrest. During a search of his person, the police found oxycodone pills. Oxycodone is in a class of medications called opiate (narcotic) analgesics. It works by changing the way the brain and nervous system respond to pain. France was arrested and held at the nearby station overnight. 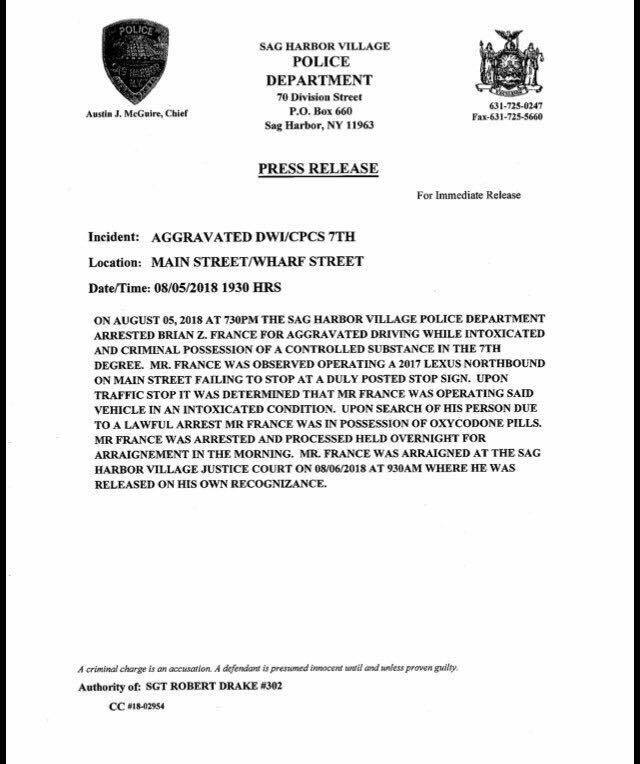 He was book for both DUI and criminal possession of a controlled substance in the 7th degree. France was released on his own recognizance Monday morning after his arraignment. It should be interesting to see if ‘NASCAR’ suspends its CEO in line with the organizational policy. Annoyed for both Chase Elliott’s win now being overshadowed by Brian France being a moron and for Spencer Gallagher who was vilified for doing what his sport’s CEO apparently also does. 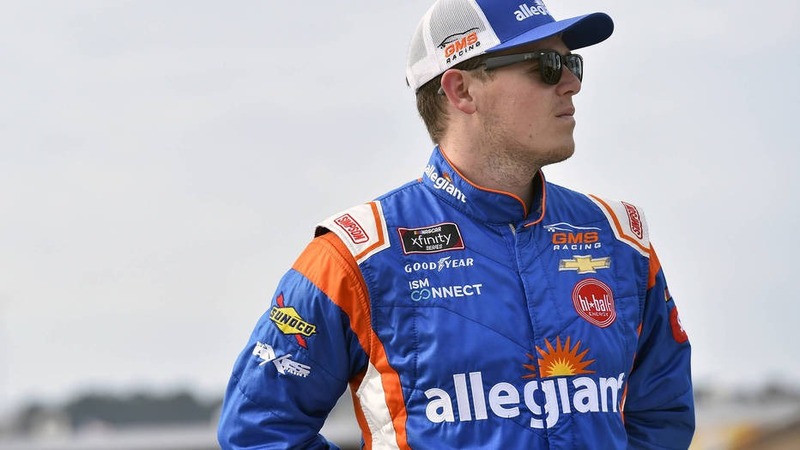 Back in May, Xfinity driver Spencer Gallagher was suspended indefinitely from NASCAR for violating the sanctioning body’s substance abuse policy - Section 19 (NASCAR’s substance abuse policy) of the 2018 NASCAR rule book. It is NASCAR Race Mom's opinion that Brian France should be held to a similar course of redemption.